Hello everyone out there. 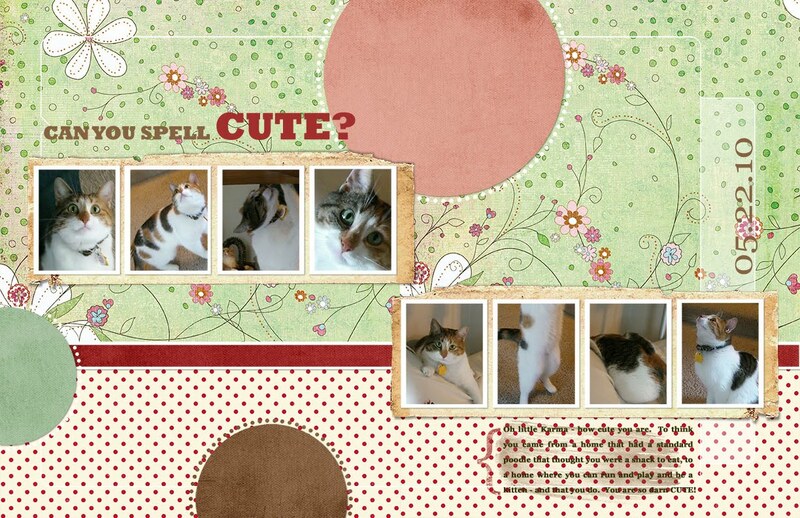 Some of you may or may not know how much I am loving digital scrapbooking. And while I love Stampin'Up's My Digital Studio for creating cards, to create scrapbook pages I use Jessica Sprague's site and Photoshop Elements 7. I love to steal away a few minutes to play on it every day if I can. I am finding that I am scrapbooking the ordinary things in my life and it is so much fun. Anyway, I don't want to get this post to be too long, so I'll just quickly tell you that the layout above is a recent 2 page 17x11 page (8.5x11 each page) template that I purchased last week from Jessica Sprague's site (hereafter JS). This is Template C in case you want to check out her site here. Then I don't know if you paper lovers out there know this, but Basic Grey has started to sell their product in digital form and so I snagged up a couple of their papers which I instantly fell in love with on this layout about Ryan & Laura's new little kitty. This is Basic Grey's Phoebe Angel Island and you can see it here if you want to check out their other digital stuff. If you like Basic Grey - you're going to LOVE their digital items. A little pricey I think, but it's sort of like buying an expensive outfit once in awhile - it never goes out of style and you just love it! So I'll sign off for tonight - enjoy my layout. Have a wonderful Memorial Day weekend. So check out my blog. While the Occasions Mini may be over, you can still get some of the items that were in there. Click on the "Carry Over" icon to the right to see everything. 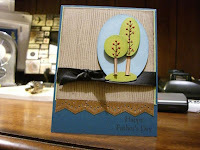 So here is the last post for the week to inspire you to make your mom or someone you know that's a mom a card. I apologize for the grey band across the bottom of the card. It doesn't show up like that anywhere else but right here, so I'm going to post it anyway just so you can get the idea. 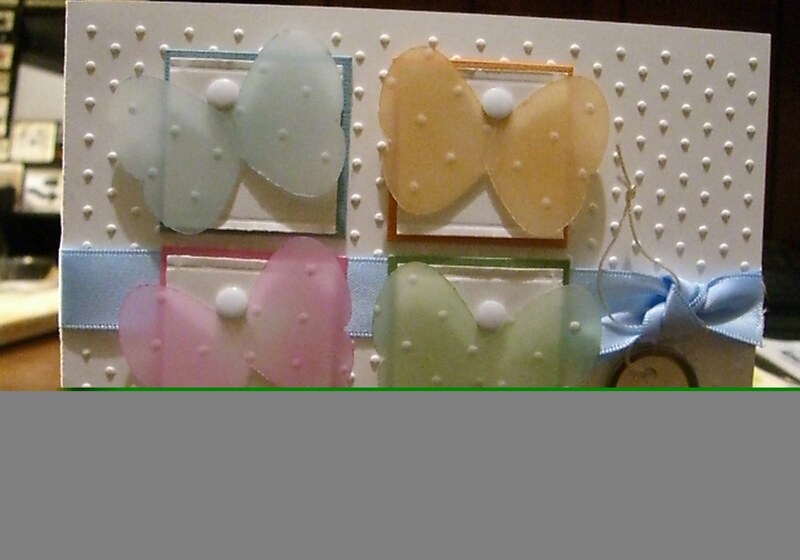 Again using the butterfly punch I punched 4 vellum butterflies, then I sponged each one in a different color. Finally, I ran them through the swiss dot embossing folder. I cut a square to match each color of butterfly and then topped that with a piece of white cardstock that embossed using my scor pal - a very thin line around each square. Wrapping a piece of the blue satin ribbon (from Stampin'Up) around the card I did my little trick where I then came back and tied a piece of ribbon as a bow on the front, first attaching one of the mini circle tags that are now available in the new Occasions Mini catalog. the white dots for each of the butterflies is a white metal foam sticker that I purchased at Joann's. I'm so sorry for the photo, but hope you can get some inspiration from it. So I tried to shoot you guys a quick post last night and for some reason I didn't save my cards appropriately for the "web" and so I couldn't do it and I fussed with it until finally my brain hurt. So tonight I thought I'd show you 2 cards - same card but one is for Mother's Day and the other is for Father's Day. How's that for a bonus!! 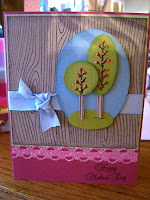 I really like that woodgrain background stamp from Stampin'Up. It is very versatile - I just didn't stamp it as dark for the female version of the card. 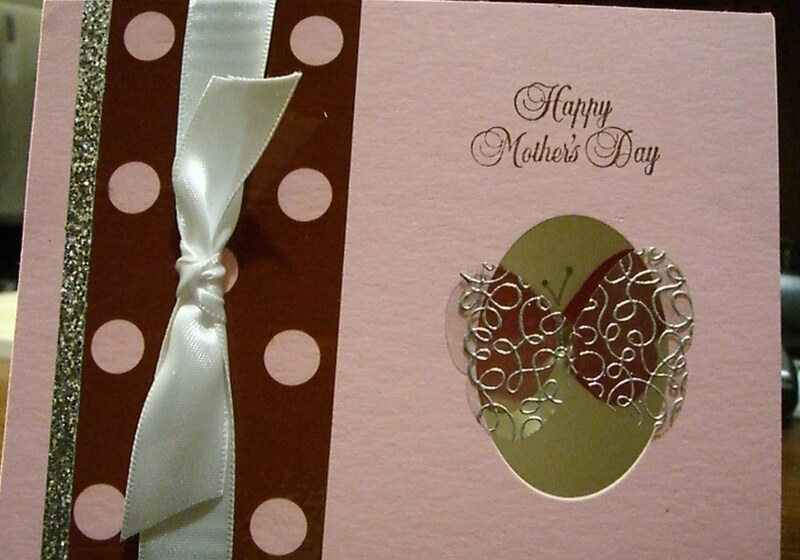 For the scallop on the bottom of the Mother's Day card I used the scallop punch on both sides of your piece of cardstock. I used a 1" circle punch and the smaller oval punch for the trees. And for the bashful blue oval behind the trees, I cut that out using my coluzzle. For the branches inside the trees, I took the branch stamp from "Trendy Trees" and inked it with a marker - being careful not to get the trunk inked, and then (of course using the stamp positioner) I stamped it twice on the paper and then punched it out I just cut out 2 little trunks using craft cardstock. Actually, little tip to make it more natural, I took a choc chip marker and freehand, drew 2 little thin lines and then cut on each side to make the trunks. I used the smallest oval punch #10 in the catalog for the grass and drew 2 little upsidedown smiles to make it look like the trunk is in the ground. So 2 exact cards - just with different colors. I hope I inspired you. Thanks for looking. Don't forget, click on the picture, then hold ctrl key down and scroll w/your mouse to zoom in and see the details of each of these cards. 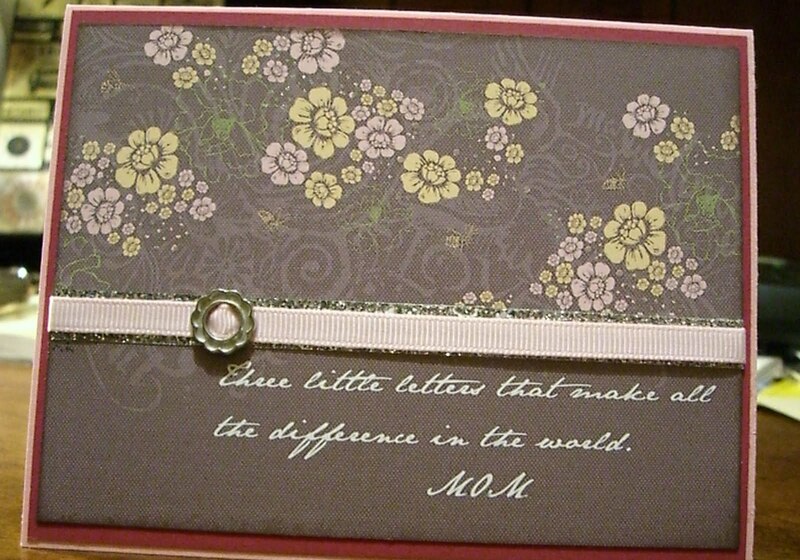 It's "make a difference Monday" in my little world and I would like to make a difference in your world and give you another Mother's Day card idea. This is a digital card using My Digital Studio and one of the Sweet Pea papers, which you could do if you don't have MDS but have the paper pad. Those of you that were able to get the paper, you'll be happy to know that you are one of the lucky ones that got some of this paper from Stampin' Up as they have run out and will no longer be carrying it. I created a text box and typed in my sentiment. Used a silver buckle and ran some pretty in pink grosgrain ribbon through it. I of course glittered it up here and there on the tiny flowers in the image. You may not be able to see that in the photo. Hi there. The last time I posted it was Friday and I was so excited the weekend was here. Well it was an absolutely gorgeous weekend. It rained on Friday night which was much needed and then rained again on Saturday night. So the weather didn't interfere with any yard work or being outside. And I don't know about you but the rain has made everything green and burst with color. Who would be interested in making a mini album with all of your pictures of your garden right now. Send me an email if you'd be interested and I'll put a class together. The weekend is over and I did have some time to make some Mother's Day cards to inspire you. First I'll show you the card I made for everyone in my club 10. I wanted to use my Stampin'Up butterfly punch but and so I stamped the squiggly design from a retired set called "By Design" set of 4 onto acetate using a Versamark pad and then embossed the design with silver embossing powder. Next I punched the butterfly out from this design. (*tip: when punching out acetate, put a piece of typing paper on both sides of the acetate so the acetate doesn't get stuck in your punch). I also punched another butter from textured cardstock, melon mambo for the inside to show thru the window. The window is punched using the wide oval. Finally, I put a piece of brown polka dot duck tape on the other side of the card (I found this at JoAnn's) and wrapped a piece of Stampin'Up's white satin ribbon around the center. So try it out and get creative. You could use this same technique with an acetate flower. I would love to see what you can come up with. I made several other Mother's Day cards - enough to post one a day this week - so hopefully my schedule will permit me to do this. Check back tomorrow for another Mother's Day card idea.